Set off on the drive to Bursa (about 1.5-2 hours drive) outside of Istanbul. During the journey we stop off at one of Turkey's protected heritage sites under the slopes of Uludag Mountain - the traditional village of Cumalikizik, with idyllic countryside setting. Here you will enjoy a stroll around the charming old village center and see the wooden Ottoman houses of the hospitable locals. 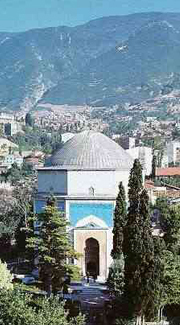 Following a lunch break, we continue on to Bursa itself, the first capital of the Ottomans. While exploring this small city you will see the Green Mosque & Tomb, the Grand Mosque, famous for its beautiful Seljuk wall calligraphy, the Silk Market and the Covered Bazaar. The return journey begins and we take a scenic route through the hills of Uludag and Mount Olympos. Return drive to Istanbul and drop off to your hotel.